Traditional company gets together with Japanese precision meshes! 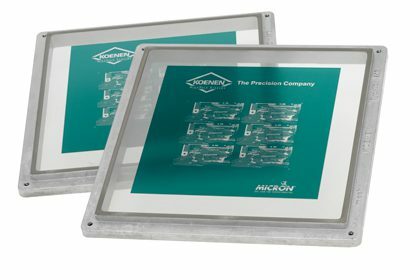 In 2018, PVF GmbH successfully sold their MICRON® precision screen production division to KOENEN GmbH. KOENEN GmbH acquired PVF GmbH’s screen business with the aim of combining the valuable production process know-how, the employees from both company’s departments and future-oriented technologies into one company in order to be able to meet customers’ increasing demands in the future. PVF GmbH manufactured MICRON® precision screens for more than 20 years and these were especially for use in industrial screen printing in high-performance sectors and they were supplied to customers throughout the world. Like PVF GmbH, KOENEN GmbH is characterised by strong innovative strength, the highest product quality and absolute reliability. This means that partners and customers of both KOENEN and PVF benefit in several ways from the synergy effects of the takeover and they can look forward to even greater productivity, employee potential and service and all of this with the highest product quality support from PVF high-performance meshes. PVF GmbH and KOENEN GmbH have formed a partnership in the material procurement sector (Japanese NBC meshes), precision screen production, customer consulting for technical printing issues and the development of proposed process-oriented solutions. that matches your pastes, printing press and applications? Then contact us! Being mesh and screen experts, we are available to you at any time and we will be pleased to help you establish contact with KOENEN GmbH. Are you facing major challenges, new and innovative projects or do you need process-oriented improvement or solution proposals? We have now been working as an innovative partner and problem solver with absolute customer focus for over 35 years.